Latest news: Although this project was approved 5:2 by the Planning Commission (see video), that decision has been “called up for review” by City Council member Jeff Herdman. A new hearing before the Council was placed on their September 25 agenda (see notice here), where was Item 18. However, according to a last minute posting, it is being “continued to a date uncertain.” In other words, the September 25 hearing has been CANCELLED. Project Overview: Application to replace the existing 2,904 square foot single family residence at the corner of Larkspur and Ocean with a new 5,216 sq. ft. home (with a 2,748 sq. ft. basement not included in that total), on a lot where the both the City’s Zoning Code and its Local Coastal Program allow at most a 4,234 sq. ft. home. Why We’re Watching: Many SPON members, and other residents, have expressed concern about the increasing “mansionization” of our community. Much of that change in character has been accomplished simply by filling lots to the very limits of the building envelope allowed by the City’s current zoning codes. But in this case, the City was presented with a request to build something even larger than than the mansion-like maximum allowed by the code. To justify the proposed size at this address, the Planning Commission had to approve both increasing the building footprint by allowing construction 5 feet into a code-required 10 foot setback, and then multiplying even that larger than code-allowed building footprint by a floor area limit multiplier greater than the code allows for any other homes in Corona del Mar. In addition to granting these deviations from the Zoning Code, this was the second time the Planning Commission had been asked to review an application for a Coastal Development Permit. Over the objections of the two Planning Commissioners who voted “no,” it again granted variances from the identical development standards about setbacks and floor area certified by the Coastal Commission in the Local Coastal Program for Newport Beach — but with no clear written authority to do so, and with the question of whether it has an implied authority currently on appeal. Newport Beach has different standards for the amount of development allowed on commercial and residential lots. The maximum amount of floor area that can be built on a commercial lot is regulated by the Floor Area Ratio (FAR), which is the ratio of the floor area to the total area of the lot. On residential lots, construction is limited by the smaller “buildable” area determined by required setbacks from the property lines. The maximum floor area that can be built on a residential lot is set by the Floor Area Limit (FAL), which is the ratio of the floor area to the “buildable” area defined by the required setbacks. This both limits the bulk of the structures and ensures open space between them, both for fire access and to ensure homes have usable yards. The Floor Area Limit in Corona del Mar (and on Balboa Island) is 1.5 times the buildable area. 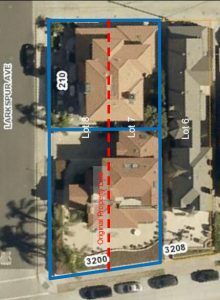 The normal setbacks that determine the buildable area for single-family residential lots throughout Newport Beach are 20 feet in the front, 10 feet in the rear and 3 or 4 feet on the sides (depending on lot width). This lot, like all those along Ocean Boulevard, is required to maintain a slightly larger than normal 24 foot front setback. The 10 foot required rear setback is completely normal in size for Newport Beach, although because this is a corner lot, the rear yard is partially visible from the Larkspur “side” street, rather than being at a completely hidden interior position. Variances to the development standards (per NBMC Sec. 20.52.090) are supposed to be difficult to obtain, and are supposed to be allowed only when due to some unusual physical peculiarity of the property not properly anticipated in the code, a strict application of the standards would deprive the owner of a right enjoyed by other property owners not suffering from that peculiarity. In the present case, the only thing unusual about the property is that it is part of what was originally two long skinny lots paralleling Larkspur and spanning from Ocean Boulevard to an alley in the rear, as illustrated with the dashed red line in the diagram at left. At some time in the past (the City doesn’t seem to have the map showing when! ), the original lots were resubdivided into two squarer shaped lots, yielding the blue configuration, with the present property having a larger-than-normal frontage along Ocean Boulevard (at bottom) and a second lot facing Larkspur (at top). Staff points out that as a result of the “realignment,” the code-required setbacks fill a relatively large fraction of the overall lot area, limiting (as the code is supposed to do) the size of the home that could be built on the lot. To allow a larger home, City staff asked for the 10 foot rear setback to be effectively reduced to 5 feet (technically, the Planning Commission was not asked to actually change the setback, but rather to allow future construction to encroach 5 feet into the 10 foot setback required by the Council-enacted Zoning Code). This was said to be match the rear setback required of neighboring property owners. However, those neighbors have lots that back up to a 15 foot alley, which provides open space between the homes and reduces their need for a rear setback from 10 to 5 feet. That logic does not apply to 3200 Ocean Blvd, whose rear property line does not abut an alley. Although the code-required setbacks would not really be changed by the Planning Commission action, City staff seems to treat them as if they were, as shown in the following Table 3 from the staff report, which shows how a reduction of the rear setback from 10 feet to 5 feet would increase the buildable area at 3200 Ocean Blvd. from 2,823 sf to 3,108 sf. But even then, the column labeled “Max Floor Area (Buildable SF x 1.5) (SF)” is particularly misleading. For every line other than “3200 Ocean Blvd (Proposed)” the number listed in that column is 1.5 times the buildable area listed in the preceding column — which is the maximum allowed floor area (note: it doesn’t mean those lots are actually occupied by homes that large). But for “3200 Ocean Blvd (Proposed)” it is a larger number pulled out of the air. The table makes it appear that if the new buildable area of 3,108 sf is multiplied by the standard maximum FAL of 1.5, the result is the owner’s proposed floor area of 5,216 sf. However, 3,108 x 1.5 = 4,662 sf — an increase of just 428 sf over the amount allowed with the normal setbacks . It is not clear the Planning Commission understood they were approving an FAL of 1.7 (or 1.9 compared to the original buildable area) when all other properties in the vicinity are allowed a maximum of 1.5. The only justification for approving 5,216 sf is that it provided the owner with an FAR similar to other homes in the area. But the size of homes is supposed to be limited by FAL, not FAR, and the FAL is supposed to limit lots with smaller buildable areas to a smaller FAR. Deviating from the FAL to achieve a certain FAR makes no sense when FAL, rather than FAR, is the thing intended to be regulated by the code. The Planning Commission approval is counter to resident concerns about a trend toward larger homes in older neighborhoods. In this case, the approved size goes not just to the maximum allowed by the Council-enacted codes, but significantly beyond it. Variances are supposed to be granted only when there is something physically peculiar about a property — yet there is very little unusual about this lot. A perfectly standard 10 foot rear setback — required throughout Newport Beach — was reduced to 5 feet even though there is nothing physically unusual about the property, other than it being a corner lot. The applicant was then allowed to compute the permissible floor area by multiplying the resulting increased buildable area by a factor (1.7) arbitrarily and significantly larger than the factor (1.5) applied to all other properties in Corona del Mar. This was justified by saying the relaxation of development standards was necessary to allow the property owners to achieve a ratio of floor area to lot size similar to their neighbors. However, FAR (floor area ratio) is a commercial standard that is supposed to be irrelevant to residential properties. The Council has purposefully regulated residential development based not lot size, but rather on the buildable area remaining after the code-required setbacks have been considered. Because the setbacks impact different lots in different ways, there is no reason to expect all residential lots to have the same, or even similar, FAR. 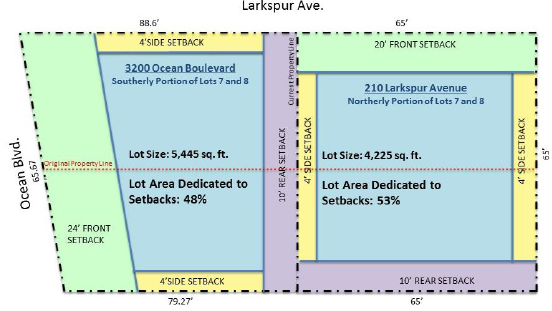 Although it is a problem common to corner lots in Newport Beach, despite the Ocean Blvd address, the “front” of this home — both existing and proposed — is actually along Larkspur, which per the City codes is regarded as a “side,” requiring (as seen in the setback diagram above) only a 4 foot setback from the sidewalk. This allows the “front” of this home to be built without the normal front yard, breaking the line of home fronts on the rest of Larkspur and for those coming down Larkspur toward Ocean intruding into the public views of the sea — and at the corner where the preservation of the views would be most valuable. Rather than reducing the code-required setbacks, to retain the character of the neighborhood the City codes could have required a 20 foot setback from both Ocean and Larkspur (since both act as “fronts”). Thankfully, most of the proposed building would no be quite as close to Larkspur as the code allows, but much of it (including in the area near Ocean, most critical to public views) is close. Since permanently changing setbacks would require a Council-approved amendment to the setback maps in the Zoning Code, it could be argued the Planning Commission didn’t technically change the setbacks, but only allowed the proposed building to encroach into the required 10 foot rear setback. If the setbacks didn’t change, then neither did the buildable area, and the ratio of the proposed above-ground floor area (5,216 sf) to the unchanged original buildable area (2,823 sf) becomes 1.85 — even farther above the maximum code-allowed FAL of 1.5. The approval of this oversized home sets a worrisome precedent for other homeowners who might similarly seek to maximize the value of their property by obtaining approval to build an oversized home with reduced setbacks and a larger-than-allowed Floor Area Limit on lots, like this, with nothing particularly unusual about them. In addition to raising concerns about deviations from the Council-imposed zoning standards, this property is in the Coastal Zone and the proposed construction required the City to approve a Coastal Development Permit under its state-certified Local Coastal Program, which promises strict adherence to the same development standards. The City has asked for, but not yet received, permission to use “modifications” and “variances” to deviate from the standards it promised the Coastal Commission. At present, its authority to approve a CDP for development not adhering to those standards cannot be found in the LCP. At an August 10, 2018, hearing, the Coastal Commission unanimously found concern about a similar action (involving the same builder) using variances to justify the granting of a CDP at 2607 Ocean Blvd. September 25, 2018: As Item 18 on their agenda, the City Council was scheduled to reconsider the Planning Commission’s August 9 approval (see “Recent Events,” below). However, a last minute posting indicates the hearing will be “continued” to a future date, as yet unknown. The notice implies City staff and the applicant have finally decided it’s unwise to approve deviations from the standards stated in the Local Coastal Plan until the City has clear authority to grant such things. Exactly when they expect to get that authority, and how great its scope might be, remain unclear. The new hearing is the result of a “call for review” by Council member Jeff Herdman, and the project should not be able to proceed until the hearing is held. It is expected to be conducted in the same format as the PC hearing, of which a video is available. In other words, City staff and the developer will be allowed a lengthy presentation after which members of the public will be invited to offer 3-minute comments pro or con. Extended comments may be submitted in writing, prior to the hearing. They can be emailed to CityClerk@newportbeachca.gov referencing Item 18. Should the City approve the Coastal Development Permit, a free appeal to the Coastal Commission by anyone who participated in the hearing, in person or in writing, is possible once the City notifies them of their final action on that portion of the approval — the main argument likely being that the City lacks authority to deviate from the development standards it promised in the LCP. Construction cannot proceed without a CDP. A denial of the CDP is not appealable. September 11, 2018: City posts Notice of Hearing to be conducted before the City Council on September 25. August 20, 2018: City Council member Jeff Herdman filed a “call for review” of the Planning Commission’s August 9 decision. A “call for review” requires City staff (pursuant to NBMC Chapters 20.64 and 21.64) to schedule a new hearing before the Council, and which the Council will render its own decision based on the same facts. August 9, 2018: The application was heard as Item 3 at the Planning Commission’s August 9 meeting (see video). The Commission voted 5:2 to accept staff’s recommendation to approve the variances to the code and issue a Coastal Development Permit. Chair Peter Zak and Commissioner Lauren Kleiman appeared to vote “no” primarily out of concern that the City should not be approving CDP’s requiring deviations from the state-certified development standards of the City’s Local Coastal Program until the City’s authority to grant such deviations (a question raised in the 2607 Ocean Blvd appeal) had been resolved. This entry was posted in Uncategorized and tagged 3200 ocean blvd, Coastal Development Permit, exceptions to rules, floor area limit, floor area ratio, mansioniazation, setbacks, variances, zoning on December 27, 2017 by Jim Mosher.